What would it take to make all your dreams come true? 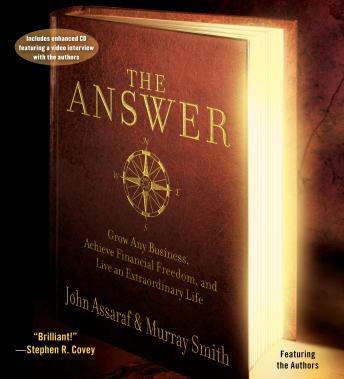 In The Answer, John Assaraf, a key team member behind the phenomenal success of The Secret, and business growth expert Murray Smith demonstrate bold, new ways to harness the unlimited power of your mind and imagination in order to achieve exactly what your heart desires. Then, they offer practical steps to grow any organization or business into a meaningful and profitable enterprise that can flourish in any economy or business climate. The Answer brings together decades of research from such areas as neuroscience, quantum physics, business coaching, and practical, hands-on business development to give you the confidence you need and the specific step-by-step actions to follow to build the business -- and life -- of your dreams.